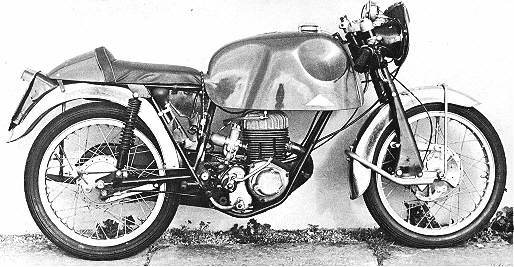 BY a cool six mpb, the Cotton "conquest'' which Derek Minter and Peter Inchley took to a class victory in the 1965 500-mile race at Castle Combe, becomes the fastest 250 we have ever tested. 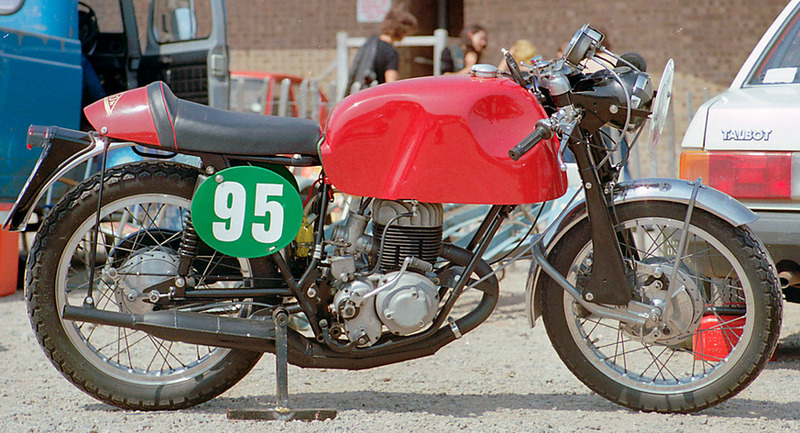 It averaged 91.9 mph round the 3-mile banked circuit of MIRA'S proving .ground, Previous best was the 86.0 mph of the Honda "Dream SS': However, this "conquest'' is a road-going racer, with questionable silencing and primitive lights, just conforming to Road Traffic Act requirements and production-machine- racing regulations. 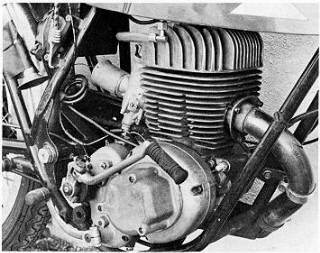 It is basically a standard "Conquest'' as turned out by the Gloucester factory, but with the compression ratio increased from 10 : 1 to 12 : 1. The test "Conquest'' had bobby-dodger items such as feeble, direct lighting in place of the standard Lucas diode lighting and a bulb horn. Shod with racing tyres, it lacked centre or prop stands. 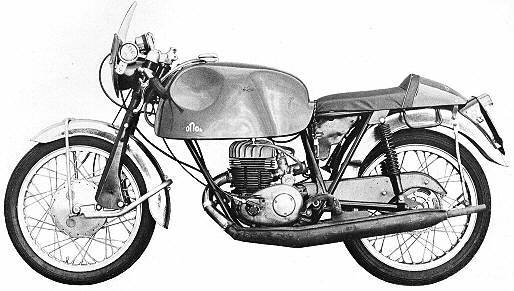 It cannot be put into the same elans as the fully-equipped and well-silenced 250 Honda. In fact, the Minter/lnchley "Conquest'' is in a class of its own. Orders for exact replicas have already been placed a provisional price of 370PS including Purchase Tax. The Cotton climbed such hills at 85 to 90mph. It was cruised at full bore by the simple expedient of putting the throttle against the stop and leaving it there from London to the Midlands and returns except past motorway roadworks, This is a race engine, designed to be run at maximum effort, and it thrives on it. 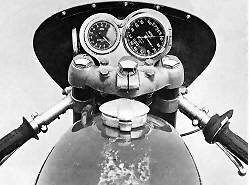 On downgrades the speedometer rose to flicker around the 114 to 116 mph mark, if the rider got his head down. This, after speedometer correction, would suggest a true 105. Owing to the engine's unusual characteristic of rising torque up to peak rpm of 8000, the machine was faster on a windswept taring lap at MIRA than it was through the one-way timing traps, the first time we have ever experienced this. This feature makes the engine rush up the power band once about 5400 had been reached. The acceleration was then staggeringly good. Below this speed, and especially under 3500 rpm when bad four-stroking set in, the rate of rev rise, even in a low gear, was poor calling for much use of the gearbox to effect a Cure. Flywheel weight was negligible. This, the lack of low- down urge, the exhaust note, made traffic riding grim. The Cotton needed a softer plug in London - and changing a plug meant some five minutes fiddling under the tank. By no stretch of the imagination can the Minter/ Inchley device be regarded as daily transport. It is in its element on the open road - and only on the open road. The motor was then untirable, free from vibration, and no thirstier than about 45 mpg. The fuel tank holds five gallons which is mixed with an R oil at 16 : 1. Starting was infallible, Idling was a lumpy 2200 rpm with the engine nagging to be given the gun, It is a motor that has to be let off the leash - and then it's tops. Matching the power plant in its high-speed excellence, the Villiers four-speed gearbox had an ultra-fast action. 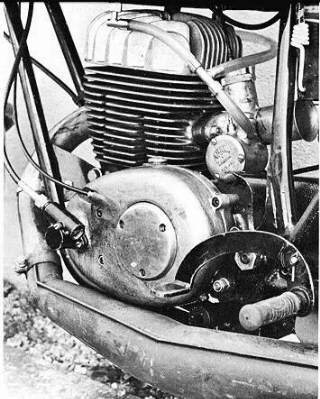 When the bike was in full flight instantaneous 2-3 and 3-4 changes could be made clutchless at 7500 rpm by simply easing the grip and lifting the reversed pedal, Clutch action was reliable but heavy. 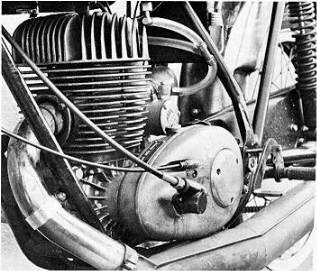 Although the clutch was slip-proof for one full-bore take-off it needed time to cool before the treatment could be repeated. Precise and confidence-breeding, the navigation became its very best when the tester slid wèll back on the racing seat. Handling was then noticeably improved, without fear of front-end tightness or of either wheel stepping out. Cornering clearance to the left was fair, To the right, it was magnificent. On the straight, over roughish roads taken at high speeds, the bike held line but some mild twitching from the Armstrong front forks set in going over an un-level railway crossing on A5 at 80 mph. This twitch, which always appears on racing Cottons over a certain type of bump, never worsens and is predictable as well as controllable, Suspension was firm, almost hard at town speeds. On the open road, it was splendidly damped as befits race-bred springing. Braking was progressive and powerful. The front unit was man enough to provoke loud tyre squeal at 70 or more mph. 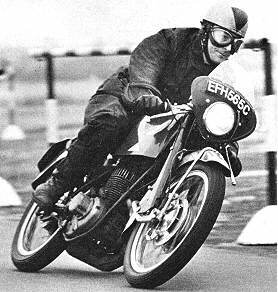 Nothing else could be expected from racing stoppers anyway, Conforming to road and race regulations, but expressly tailored for one particular event, the Minter/ lnchley Cotton conquest is a magnificent highway burner to take out into the country for the sheer zest of motorcyclist. (Top right) The tacho drive is taken direct from the Starmaker Crankshaft. Cable into top of chaincase controls the diaphragm clutch. 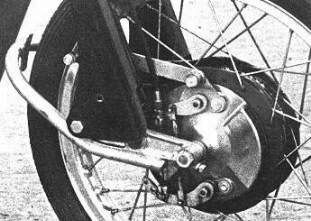 (Top Left) The 7"-inch brake on the British Hub wheel has 2 leading shoes and a parallelogram reaction linkage. (Bottom left) Crank in the folding kickstart is to clear the reversed gear pedal whlch has up-for-up action. ( Bottom right) Distinctive finning of the later type Starmaker whose central exhaust port imposes severe frame constraints. Villiers energy-trans- fer flywheel magneto with direct lighting from aternator coils. Villiers bolted-on four-speed box, Overall ratios of 5.6, 6.7, 8.0, 12.3: 1 Two-plate sintered-bronze diaphragm-spring clutch. standard machine:279pound 12s. (inc 46pound 12s P.T.) , Exact replica: approximately 90pound extra.